A casual conversation about favorite gardening books led us to browse a copy of Celia Thaxter’s An Island Garden from the University of Vermont’s Rare Book collection. We discovered that our copy is especially interesting for content that was added after the book was printed and for the connection that brought it to UVM. 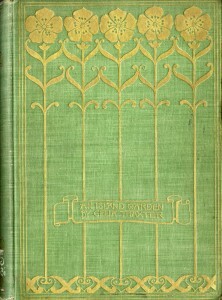 Sarah Wyman Whitman used a simple floral motif for An Island Garden’s cover. Celia Thaxter was a popular poet and artist during the nineteenth century. Her family operated a fashionable summer resort on the Isles of Shoals off the New Hampshire coast that attracted distinguished artists, writers and musicians. Despite the challenging soil and climate, Thaxter added to the natural beauty of rocky Appledore Island with a luxuriant flower garden. 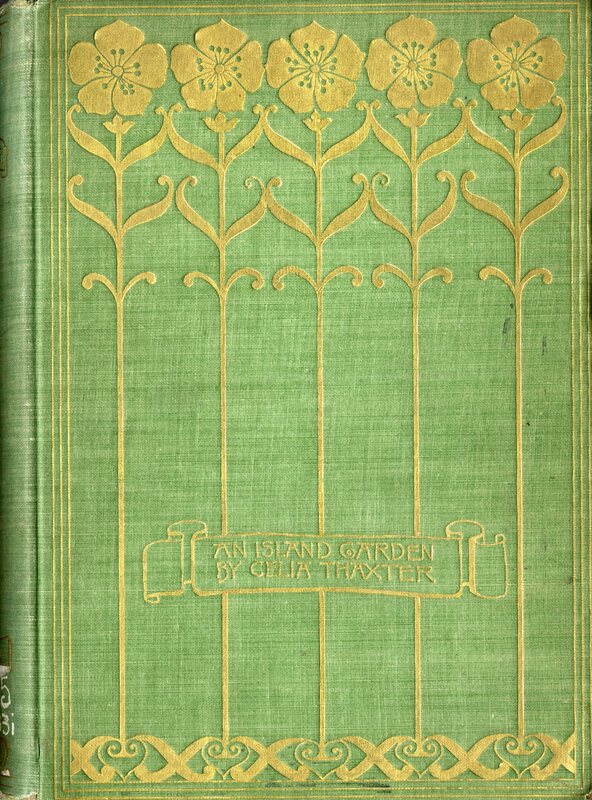 The garden was the subject of her last book, An Island Garden, which came out in the spring of 1894. She worked with the American Impressionist painter Childe Hassam, a friend who painted scenes and people at the Isles of Shoals for many years, to illustrate the book. The UVM copy of An Island Garden originally belonged to Evelyn Benedict. A talented pianist, Benedict was part of the circle of prominent artistic and literary figures who gathered for Thaxter’s summer salons. Benedict’s correspondence with Thaxter and other visitors, including Henry and Clara Rogers, J. Appleton Brown, William Mason, and Henry Alden Mills, indicates how important the Isles of Shoals summers were to all of them. (Benedict’s correspondence is part of the Henry Munroe Rogers papers housed at the Houghton Library, Harvard University). Childe Hassam painted Evelyn Benedict at the Isles of Shoals in 1890. 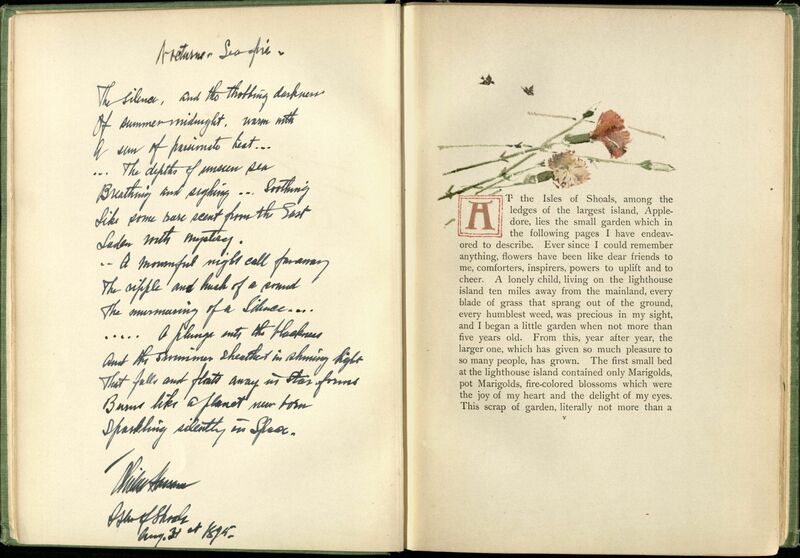 In March 1894, Celia Thaxter thanked Benedict for “all the kind things” she said about the garden book that Thaxter had sent her. In that letter, and in subsequent letters written in May and July, Thaxter encouraged Benedict to come to the Isles of Shoals. Sadly, Thaxter died that August. It’s not clear if Benedict was on the island then, but other guests attended the poet’s burial on the island. During the year after Thaxter’s death, Benedict created a memorial album of sorts in her copy of An Island Garden. The landscape painter J. Appleton Brown was the first to write in the book. 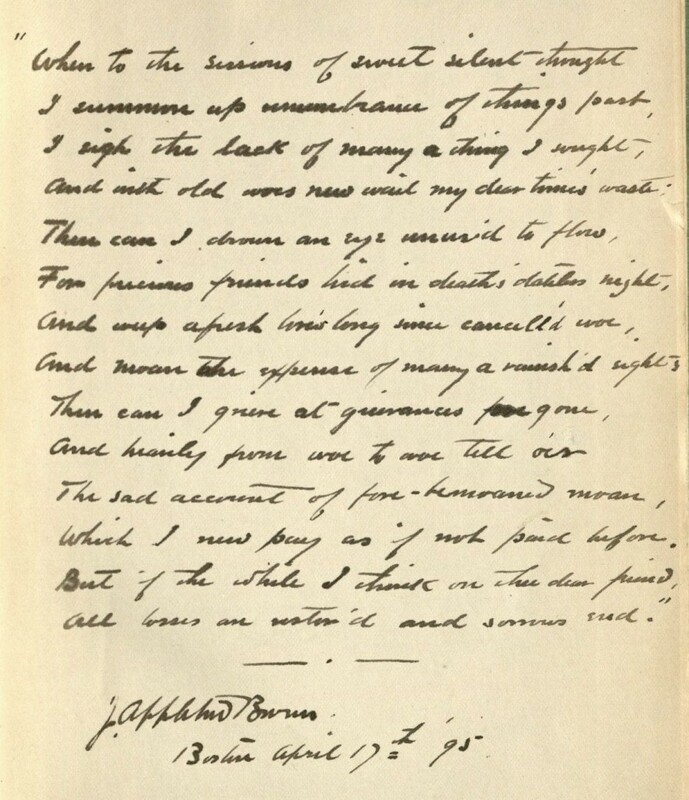 In Boston on April 17, 1895, he transcribed Shakespeare’s sonnet, “When to the sessions of sweet silent thought,” on a blank page. A few days later, Clara Kathleen Rogers, a composer, singer, writer and educator, filled another page. Painter J. Appleton Brown’s contribution, dated April 17, 1895. The last two tributes were written in August. A round robin letter sent to Henry and Clara Rogers confirms that twelve of Celia Thaxter’s friends gathered at Appledore Island on the first anniversary of her death, including Benedict, William Mason and Childe Hassam. 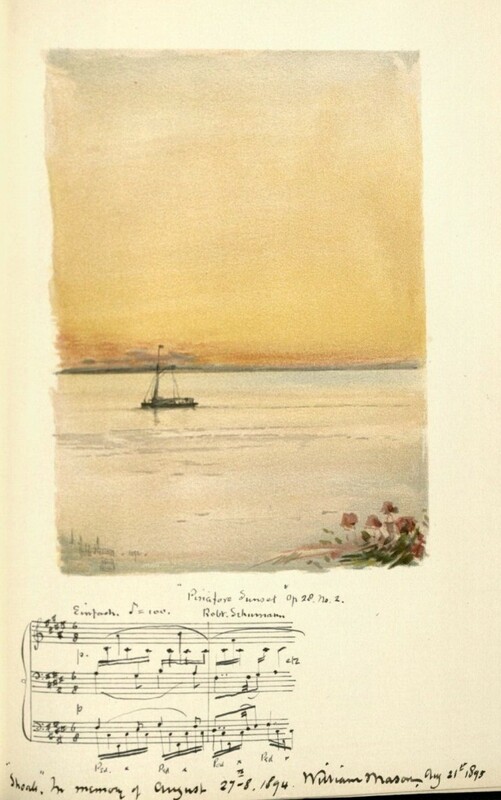 Mason, a pianist and composer, transcribed bars from the score for Robert Schumann’s Romance in F-sharp Major under Hassam’s painting of the island ferry Pinafore at sunset. Hassam wrote “Nocturne Seafire,” a reflection on the sights and sounds of a summer night by the sea, on a blank page opposite one of the floral headpieces he designed for the book. Musician William Mason’s tribute, added on August 21, 1895. Childe Hassam wrote about the sea at night on August 21, 1895. The accession number recorded on the inside front cover indicates that An Island Garden was one of a number of books that Evelyn Benedict donated to UVM in 1943. Although Benedict was born in New York City, and lived most of her life in New York, Boston, Italy, and Newport, Rhode Island, she was a member of a prominent Burlington, Vermont family. Evelyn’s grandfather, George Wyllys Benedict, taught at UVM from 1825 to 1847. Benedict and his son George Grenville ran the Burlington Free Press, and both served on the UVM Board of Trustees. In 1908, Evelyn’s father, Robert Dewey Benedict, retired from the practice of admiralty law in New York and retired to Burlington with his family. City directories list Evelyn at the family home on South Williams Street until 1920, when she moved to the Beacon Hill section of Boston. She died in Newport, Rhode Island in 1967 when she was 99, but was buried in Greenmount Cemetery in Burlington. The Vermont Alumnus acknowledged in 1942 that “Miss Evelyn Benedict, formerly of Burlington, now of many places, has given the University, dozens of pieces of dinnerware from her family sets and from collections she has made abroad,” but did not mention her donation to the library. By 1943, Benedict’s friends from the Isles of Shoals were long gone and perhaps her memories of the Isles of Shoals summers had faded. The tributes she collected in the UVM copy of An Island Garden, along with the letters preserved at the Houghton Library, provide an enduring record of just some of the friendships that flourished on Appledore Island under Celia Thaxter’s cultivation. This entry was posted in Rare Books, University Archives, Vermontiana and tagged An Island Garden, Celia Thaxter, Childe Hassam, Isles of Shoals, University of Vermont. Bookmark the permalink.